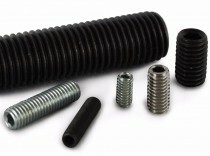 An extensive and ever growing range of socket head screws in imperial threads UNC, UNC, BSW, BSF and BA. Our range covers socket cap head, socket button head, socket countersunk head and socket set screw (also commonly knows as grubb screws) styles, and is available in high tensile steel, A2 stainless steel and A4 marine grade stainless steel. We can source most sizes of imperial socket screw, so if you cannot find the size you require, please contact our sales team who will be happy to help.